Beijing was a hotspot for young professionals in agriculture, last week. The Chinese Academy of Agricultural Sciences (CAAS) hosted the “APEC Food Security Training and Workshop” on September 7-9, 2015. 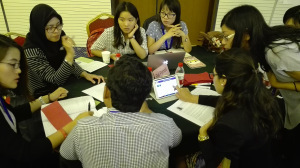 This event, funded by the Ministry of Finance of the People’s Republic of China aimed at training over 30 young researchers from Asia Pacific Economic Conference countries’ to build their capacity in tackling food security issues. As a representative of the Global Forum, I was invited to attend this event and offered the participants to dip into plausible futures for young professionals working in agricultural research and innovation systems.